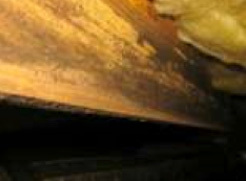 Wood rot or decay fungus can destroy the wood in your crawl space. The fungi attack the cellular structure of the wood, and if left untreated will affect the structural integrity of the wood over time. 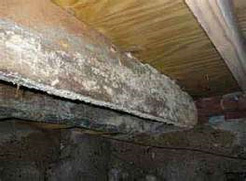 The decay fungus requires oxygen, water, favorable temperatures, and food(wood) to grow, all of which can be found in your crawlspace. You don’t necessarily have to have a leak in your crawlspace for fungus to grow, a lot of moisture comes from the ground in your crawlspace. There is a remedy for wood rot fungus. Make sure the moisture level is controlled in your crawlspace and treat the wood in the crawlspace with a borate chemical application. We use Bora-care® to eliminate fungus and protect wood from future infestation.